The primary purpose of the Huairou Commission Delegation’s visit to Recife was to represent grassroots women’s groups across Central and South America in the form of an international Community Land Watch. 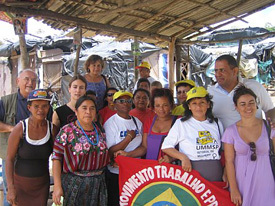 The Delegation acted as international observers during a public seminar “Justice, Land and Housing,” organized by Casa de Mulher do Nordeste (Northeastern Women’s House) that gave the results of a year-and-a-half long process of information gathering and research with women who are landless, in social movements and living in acampamentos, or informal camps, throughout the state. Instead of inviting professionals, government bureaucrats and other stakeholders to give presentations, Casa wanted the women themselves to represent their interests and ask questions directly to the participants for their response. In order to do so, Casa conducted a two-day preparatory meeting in which Huairou representatives took part. In addition to participating in the Seminar, the Huairou Team was also able to visit some of the acampamentos directly. The following article describes what we learned from conducting this three day Community Land Watch Brazil. It was repeatedly expressed during the three days of debate and exchange in Recife that there are significant political and economic barriers regarding the viability of agrarian reform. Principally, major land holders and owners of the largest businesses in Brazil have influence over, or hold political positions that enable them to counteract or prohibit advancements in the reform process (for example 60% of those that holding legislative positions are major landholders). Not only is there a lack of political will, but there are real and powerful forces whose interests are in direct conflict with agrarian reform. Casa do Mulher received funding from INCRA, the governmental arm responsible for agrarian reform and disputes/conflicts related to land, to conduct research in eighteen districts in Pernambuco with over 700 landless women who reside in acampamentos. 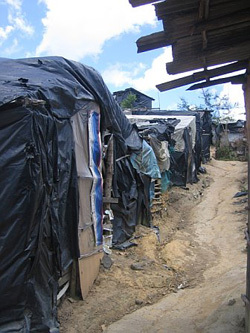 While some of the acampamentos were relatively new (1-3 years), many were living in camps that were established between seven and ten years ago signifying that the struggles that many have gone through have been long and without end. Nearly all of the women belonged to a social movement. In all, ten different movements were represented through the research participants. In addition to research, Casa conducted a series of formaçãoes, or workshop trainings, on women’s rights to not only land and housing, but to education, health and other social benefits that all Brazilians are entitled too. Most often, because of the fact that these women are without formal land or property, they are unable to access such basic rights or are discriminated against within institutions. Overall women residing in acampamentos feel that they are completely ignored by the society in general. They feel that no one in the government is responsible for helping to improve their situation or is accountable for their exclusion. “Our struggle is both internal and external, as we feel the need to strengthen women’s leadership both internally within our movement as well as to be strongly represented when negotiating with authorities and other stakeholders. Women are not only working to occupy space and attain voice in decision-making structures, we are also need to generate income for ourselves. We are looking for strategies to do both, strengthen our voice as well as our ability to sustain our livelihoods.” - Perspective from a member of the recently-formed Women’s Commission within Movimento Sem Terra (MST), or Landless Movement, the largest and most well-known landless movement in Brazil with representation in all 26 states. The Seminar “Justice, Land and Housing: Women’s Rights” was organized in such a way that the women who are the ones living in the acampamentos were the ones to present their situation and ask questions to the panelists that were invited. The Seminar was organized into three different tables (sections) including Public Policies, Basic Services and Agrarian Reform. The Casa team supported the women to present the findings and elaborate on some of the statistics. Once the findings were presented, a question was directed to each of the stakeholders present. Government officials and departments, academics and representatives of social organizations and movements were all represented. After each presentation the conversation was open for debate, allowing more of the women to ask questions. Contributions were also made by the Huairou delegation. Overall, the Seminar was successful in bringing the issues and conditions of women living without land to the forefront. Many of the women were able to speak on their own behalf and directly asked questions to those who represent the government and bureaucratic offices that are charged with having their interests at hand. There were only a couple of representatives present that weren’t entirely supportive of the issues at hand, which demonstrated the significant challenges that these women face. The members of the Latin American Land and Housing Campaign of the Huairou Commission will continue to track the progress of these commitments and ensure that the continuing struggle in Brazil and across the region is visible. After spending the day in the Seminar, the Huairou delegation traveled to the outskirts of the city (about 1-2 hours from Recife) to visit four acampamentos to meet with the women, learn more about their living conditions and share experiences and messages of solidarity. The first stop was a camp called Relogio in the municipality of Cabo de Santo Agostinho, belonging to the MTP movement. Our visit here was brief, but we learned that the residents are currently being directly threatened with eviction as a result of recent road construction and expansion. This camp has been working with a lawyer to negotiate the conditions of their evictions and their access to permanent land for them to settle. They are being offered a subsidy, but the lawyer is telling them they can take this or not, but to be clear they are not leaving until there is land secured for them to move to. Our second visit was to Bom Jesus in the Amaraji municipality who make part of the MTBST movement. We heard directly from the people how they are being constantly threatened with violence and how they are denied justice within the legal system. In May a coordinator of the social movement represented in this camp was shot and killed in the center of the city. Across the movement the killer is known, but until now nothing has been done to punish the perpetrator. Like many of the social movements represented in the camps, violence and impunity are key issues for the residents. Within the same municipality we also visited Ponta de Pau, Amaraji which belongs to the MTRUB movement. Not only are women and men in this camp facing direct threats (incidents of people throwing cans and bottles at their tents as they pass by the camps), but they also are unable to access health, and no access to water, sanitation and electricity. In particular the residents shared with us the struggle they have to go through to try to access health care, which many need as a direct result of the conditions of the camps. Patricia Chaves of Casa do Mulher reinforced to the residents that this is a denial of their rights and health employees such as these are not doing their jobs and violating the law. We talked about how they can redress these issues within the office of ‘Public Defense’ and ensured they have the appropriate contact numbers to follow-up. Our last visit of the day was to Chico Mendes in the municipality of Sao Lourenço and a camp of MST, one of the strongest landless movements in the country. As one of the largest camps in the region with 346 families residing in the camp, the Huairou delegation was warmly welcomed with a marching band. We met in their community school and again, shared our experiences and challenges in land access. The camp was particularly tense when we visited because they had been recently given a date, determined by a judge, by which INCRA was to resolve the issue of their camp. Until now there has been no resolution. The camp has been affronted in the past with an attempt to forcible evict the residents, although this time they worry they won’t be able to resist an attack and will be forced to leave their homes of over 6 years. Located on the land of one of the largest Brazilian companies, the law is weighted heavily on the side of the businesses. Violence against the movement is particularly strong, the movement overall has lost three leaders in the past year. In addition, the day after we left this visit there was a state meeting for MST. As two buses were traveling to the meeting from a camp in the Sertão, they were shot at. One person was killed and a number of people were injured. Overall, our delegation’s primary feeling was of incredible empathy for the suffering people are going through and the struggle they will continue to face to secure permanent land to live and work on. As an international delegation, our message was one of solidarity and of support to reinforce that they are not invisible and their fight will be documented and shared throughout the network. The international delegation of women not only shared their similar suffering, they also shared practical strategies. To build on the importance of working and negotiating with politicians, Maria das Gracas of UMMSP and Haydee Rodriguez stressed the importance of getting concrete commitments from politicians, detailing how the Forum for urban reform in Brazil used a similar strategy to get parliamentarians to sign on to their promises, so this could be a strategy taken up by the agrarian reform movement. In addition, Haydee’s emphasized the need to work across parties. The cooperatives of Nicaragua are comprised of women across political perspectives and they use this to their advantage. When they are looking for support or backing from a particular political leader, they send the person that is of that party to negotiate and request support. Finally, Haydee stressed the importance of being present when key decisions are being made. Regardless if you are able to speak or not in the session, it is important that your group and constituency are outside in mass to ensure your voices and priorities are seen and heard.